The last 48 hours have been a whirlwind and have swept by so fast I’ve barely had time to breathe. Only last night did I catch up with my social media mentions from Tuesday! To say I am humbled and overwhelmed by the many people who have supported the release of ROAM is an understatement. So, for today’s post, let me start with a huge THANK YOU to all who wished me a “Happy Book Birthday” for ROAM. Your kindness is beyond my wildest imagination! Thank you to the Writing Community on Social Media for being so kind to give ROAM a shout-out on Tuesday, before and since. I have NEVER had so many mentions on Twitter and Instagram, and I’m beyond words. There were literally a hundred or more for each of the two sites! And that doesn’t include Facebook! Thank you to the many bloggers who took time to not only read ROAM, but write reviews. For those who made a point of holding your reviews to run on release day, WOW! Y’all are truly the best. I’m overwhelmed by your kindness! Thank you to my social media friends and followers , as well as my real world friends, who reached out to not only send congratulations, but to share posts on social media! I’m so grateful! You will never know how much you mean to me! Thank you to my publisher, Michelle Halket at Central Avenue Publishing. I could not be more blessed than to be one of Michelle’s projects! Every author should have the opportunity to work with a publisher as amazing as Michelle! Thank you to Mayo High School and Pattie Ekman for allowing me to present to your English Classes on Monday. I had more fun meeting the students, and they were all so gracious! They made me feel welcome, and their excitement over our “Kindness Raffle” was really fun! (More about the Kindness Raffle in another post). Thank you to St. Louis Park Middle School and Lisa Lillie for inviting me to present at your school on Tuesday. OH MY GOSH — your kids are the reason why we write! Their excitement was palpable, and I can’t thank them enough for their welcome! Thank you to Jenna, Jamie and Ann at Barnes & Noble Galleria in Edina, Minn., for hosting my first book signing. This was so much fun! I thought we were going to be snowed out! The roads were so bad I would’ve cancelled if not for the slight possibility that even one person might’ve shown up and been disappointment. To my complete shock, about a dozen students made their parents hazard the awful roads to come to my signing. And we had so much fun! I think we were probably the only people in the store aside from the stray shopper and staff, but we had a wonderful time! I loved our questions, and I loved the stories you shared. Yes, Henry…as the oldest, your younger siblings will always get away with way more than you ever did! That’s the “bonus” of being the oldest child. We moms put 100% of our energies into our first children and, when the next ones come along, we’re tired! We love them just as much, but we realize they’ll turn out just fine if we stop hovering. Haha! And finally, my biggest and most humble thank you of all goes out to the OTHER debut young adult and middle grade authors who took time out of their own release days to congratulate me on mine! My only regret of the day is that I didn’t think ahead to plan social media posts to automatically post my congratulations to each of you on Tuesday. But I am deeply grateful, so at the end of this post is a shout-out to those authors who also had Book Birthdays on Tuesday! I hope y’all will take a minute to look at their amazing titles! So…What was my day like on Tuesday? Well, in all honesty, my “day” started on Monday with a presentation to four English classes at Mayo High School. This was a special series of presentations to me because the high school is special to me. It’s where my daughter graduated in 2014 and, since I was writing ROAM during that period of time, much of the story takes place within its walls — by a different name (Rochester South). But anyone from the area knows “Rochester South” of the book is Mayo. After all, how many completely round schools are there? I went home exhausted, yet exhilarated, on Monday; then woke up at 5:30 on Tuesday morning to leave for St. Louis Park (a 90 minute drive without traffic) to present to five classes. These kids were so fantastic, and I was shocked to learn how many students have already worked in some capacity with their homeless communities. Y’all are just fantastic! While there, I had the opportunity to meet the office staff, the school principal, and even the Superintendent of Schools. I’m just so grateful for the welcome I received, and am excited to go back…because I’ve been invited back to present to other classes! Thank you, Lisa Lillie for setting these up! I had a great day! At the end of my presentations at St. Louis Park Middle School, I was supposed to present to an after school assembly for those who were unable to attend during the day. Sadly, due to weather, all after school activities were cancelled. So I bundled up and drove the roughly 15 miles to my hotel in Edina, in preparation for my night signing at B&N. Well, the roads were AWFUL! It took me (and I’m NOT kidding) more than 2.5 hours to drive those 15 or fewer miles! When I finally got to the hotel, I had about an hour to relax and have dinner before heading out again. Thank goodness for Jimmy Johns delivery! At 7:00, I showed up for my signing at the Barnes & Noble in Edina at the Galleria Mall. Y’all, if you’ve never been to this Barnes & Noble, you really MUST visit them! Truly, they have the nicest, friendliest, most helpful staff of any Barnes & Noble I’ve ever visited. I first visited this store back in June, and I knew immediately I wanted to do my launch at this store. And I was right. They made the experience so fun, even though the roads were awful and — aside from those who hazarded the roads to attend my signing — the store was virtually empty. Returning back to the hotel at around 9:30, I’d really hoped to sleep in until at least 11:00 the next morning. But, alas, I was still riding high on adrenaline and not only had difficulty falling asleep, but was awake by 5:30 a.m. with excitement for the day and my drive back home. So What’s Next on My Calendar? Today is a “rest day” for me (which really means I have to clean my house since I’ve been ignoring it). Tomorrow, I head to Lanesboro Schools for a day full of presentations to their middle and high schools. Saturday, February 9th, I’ll be kicking off my local book tour at the Barnes & Noble Apache Mall in Rochester, Minn. I’ll be reading and signing books from 2:30 to 4:00 p.m. I really hope y’all will join me. You can find the Facebook event invitation with more information at this link. Sunday, February 10th, I’ll be at Pasquale’s Neighborhood Pizzeria in Rochester, Minn., where I’ll be signing books from 1:00 to 3:00 p .m. This one ought to be a HUGELY fun signing, as I’ll not only be offering up free copies of ROAM to five random winners, but you seriously can’t beat the pizza at Pasquale’s. For more information on this event, use this link to view the Facebook event invite. Monday, February 11th, I’ll be at Stewartville Public Library in Stewartville, Minn., from 6:30 to 8:00 p.m. THIS is the library I consider to be my own library. Though I live in the neighboring town, I love going to Stewartville’s library because it reminds me of the library I grew up in. It’s small and friendly, yet they have everything you could ever need…or will get it for you if they don’t have it. To view the Facebook event invite, use this link. I think I’ll stop with Monday, or this post will go on for pages. If you’d like to figure out where I am to come to a signing, you can use this link. Check out these debut Young Adult and Middle Grade novels that also released on Tuesday with ROAM. You seriously won’t be sorry! 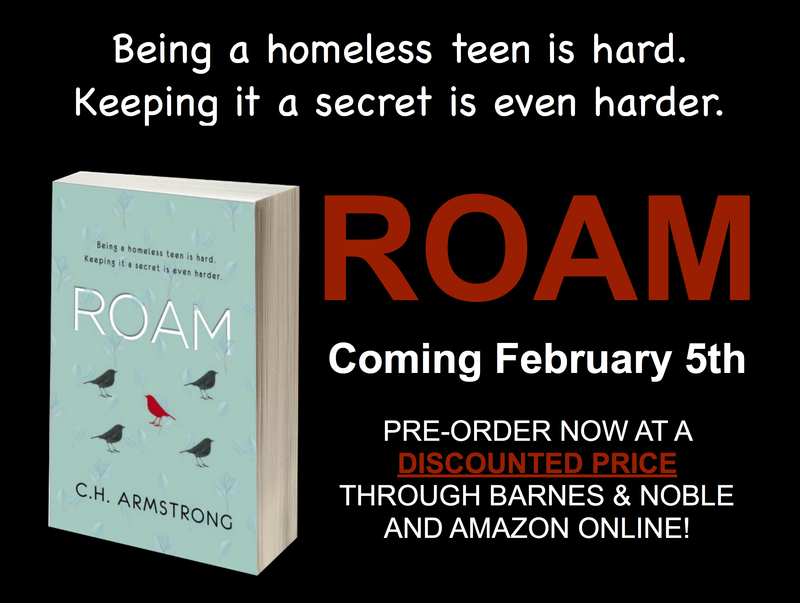 HAPPY BOOK BIRTHDAY TO ROAM!